The course is fast because it’s flat, smooth surface and you get a drag from passing cars. The weather forecast for Sun was one of those forecasts all testers dream of – warm, no wind and dry. I’ve ridden through enough gales this year, to feel I deserve a ‘float’ day for a change. As it happened, it was relatively cold when I arrived at the HQ. I had been so confident of a hot day, I didn’t have many layers. 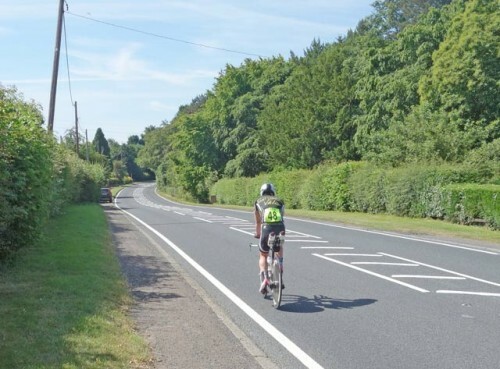 Although the course is fast, it’s not all dual carriageway. The first 15 miles was based on a B road. Early in the morning it was as quiet as the still atmosphere. No cars, no nothing, just you and the bike. I really enjoyed this stretch. The first 10 miles of a 10 is always quite easy. You can get decent speed, as you are quite fresh. However, it didn’t all go to plan. Over the first lump in the road, my rear saddle mounted water bottle ejected itself never to be seen again. I’m not sure why I bother writing blog posts – I never listen to my own advice, I didn’t have a spare bottle planted anywhere on the course. I did test the bottle cage, and although it failed in testing – I thought I’d done a clever trick in sticking some thing on bottle to hold it in place. Anyway, it was gone and I wasn’t doing a u-turn to look for it. I still had 1.6 litres in 2 water bottles, and since it was quite cold, I wasn’t too badly affected. Nevertheless, I spent the first hour thinking about asking someone on route for a spare. But, because it was so cold, I felt my bladder filling up pretty quick from water drunk before start, and this dissuaded me from drinking. It took 70 miles to drink the first 750ml (with 2 gels). The E2/100 is one of those courses where you can actually get into a good rhythm. There are no hills to speak of – just a few gentle drags. It’s not exactly hill climbers territory, but even mountain goats enjoy cycling fast on the flat. The road is super smooth, and a great relief after several races of being jarred over the bumps of the A31. Pacing is important in a 100, and I had a fairly good idea since doing one 100, and quite a few 50s this year. I didn’t really look at power meter for first 2 hours – just the occasional glance – which usually led to knocking off the pace. After 2 hours, I’d averaged about 270 watts – same as in the Hounslow 100 a few weeks ago. But, the good thing about this race, is that I was in slightly better shape for the last half. The power ebbed away a little, but not very much compared to the last 100. Average power for race was around 262 watts, compared to 256 watts in Hounslow. At 90 miles, I had a 3.19 on the clock. All I needed was a 20 minute 10, and I’d have an amazing time. But, the last 10 miles were never going to be quick. As soon as you got on the rougher B road, you saw the speed plummet. A road which seemed quite nice at 6am when you were fresh, now felt particularly hard work. In the end, I had to really dig deep to get to the finish. By this point I’d run out of drink and was getting thirsty. Still I stopped the clock in 3.34.17. 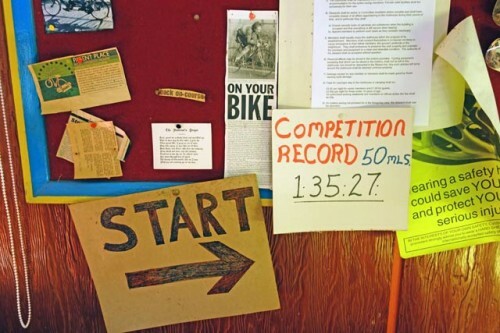 You can’t complain when you take 10 minutes off your pb, and over 12 minutes off 2013 pb. I guess I will never take 10 minutes off a pb again. I enjoyed the event and was glad to get a pb. Good event put on by ECCA. 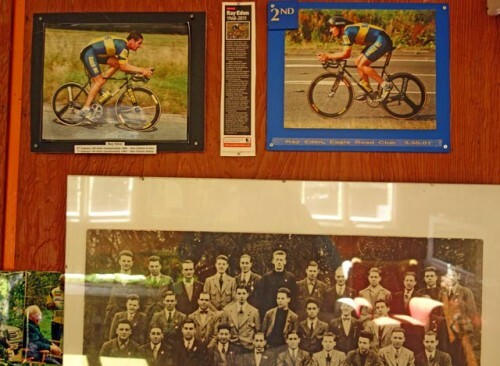 After the race, I also enjoyed sitting in the Eagle Road Club hut and looking at the cycling memorabilia. After a reviving cup of tea and sandwich I dragged my tired body into car and began drive home. As I was driving home, I saw one of the competitors, running up and down the road! I guessed he was a triathlete before the race, just by looking at his muscular upper body and bike. But, still to go running after a 100 mile TT, that was really amazing – I can’t walk up and down the stairs properly, let alone go for a jog. Bad luck to Michael Broadwith who punctured after 8 miles. Cheers Tejvan. That was a fantastic ride by you, well done. Your pacing is really good, very interesting to see the chart. I have been using a PM in training but not racing, but seeing that makes me jealous and tempted. Hopefully I’ll have the chance to race you properly over 100 miles at the National? Chapeau! As expected I lost a bottle from the rear carrier but not until the first turn on the dual carriageway. I had a speed fill which worked really well and I immediately poured the second bottle into the speedfill, I really missed the extra fuel for the last 20 miles. Amazing ride, well done on that time and spot on pacing, good luck on the national I’m sure the sporting course will suit you well ! Great work Tejvan, your pacing is excellent, really enjoying your site. Great ride yesterday and fantastic pacing. I’m convinced the last 3km was the hilliest and roughest 3km I’ve ever done! strange as it felt whisper smooth at the start. Great ride and an excellent read – its comforting to know you guys at the sharp end felt the final 8 miles… I lost 30 seconds a mile over that stretch. Still a PB so I guess I mustn’t grumble. Teejay – great ride and write up. I rode too and it was like somebody had opened a parachute in the last 10k on that road! 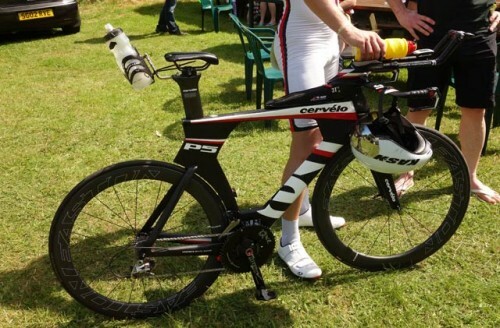 Out of interest – if you’re happy to share – what percentage of FTP is the 262W for you? I’m not sure what my FTP is because I haven’t done a 25 this year. Last 10 was at 335. last 50 290 watt. I’m guessing 305, 310.